Our Food Safe Mineral Oil is OUT OF STOCK, but we have ordered more! You are still able to purchase it now and we will ship it to you as soon as it arrives. Questions? Please call 1-800-438-5346 or email us at info@Lehmans.com. Food safe mineral oil deeply penetrates wood to protect against drying, cracking and splitting - and it won't turn rancid like regular vegetable oil. 8 fl oz bottle. 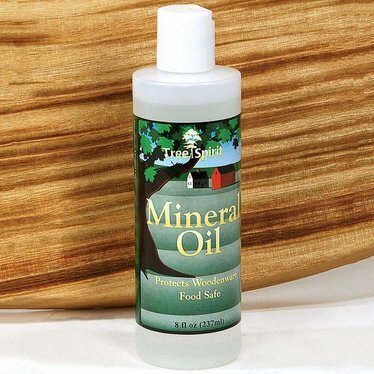 Food Safe Mineral Oil Food safe mineral oil deeply penetrates wood to protect against drying, cracking and splitting - and it won't turn rancid like regular vegetable oil. 8 fl oz bottle. This stuff lasts forever! I use it on our cast iron, wood, and knife blades! Not sticky at all and rehydrates wood handles, cutting boards, etc. beautifully! I use Lehman's Food Grade Mineral Oil on my wooden cutting board, wooden rolling pin and wooden spoons. Love,love,love it! It really conditions the wood!